Click on the red icon to buy tickets for this session. On AMC / Fandango page enter theater zip code 02111 and click on showing date to purchase tickets. Two WWII prison camp escapees from different walks of life discover an unexpected common ground after being forced into an unusual situation involving a hidden explosive. Cast : Danny Hirtler, Dylan James, Emmanuel Barb, Kevin Carillo, Miles Duffield, Paul Gibson, Phil Newsome, Rebecca Dereienzo, Thomas Sauer. 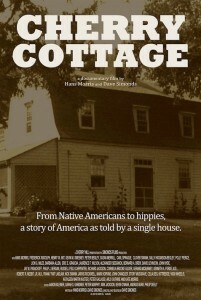 This feature-length documentary tells the story of America through the owners and inhabitants of a small cottage in Stockbridge, Massachusetts. We meet Hans Morris and follow him as he discovers the history of the little house on the edge of his property. From the Native American inhabitants of New England to the 1960s counterculture, the history of Cherry Cottage is intertwined with the history of the region and the country as a whole. Cast: Arlo Guthrie,Barbara Allen, Clover Swann, David Levinson, Frederick Rudolph, Gerard McBurney,Hans Morris, Henry W. Art, Jarvis Rockwell, John Hyde, Kate Morris, Kathleen Martin Kaster, Kenneth A. Forde, Kevin Sweeny, Lion G. Miles, Mark Hopkins, Nick Swann, Peter Begley, Philip J. Bergan, Polly Pierce,Robert R. Nesbit, Jr, Russel Field Carpenter, Sally Higginson Begley, Story Musgrave, Susan Merrill, Vicki Wheelis Jenkins.